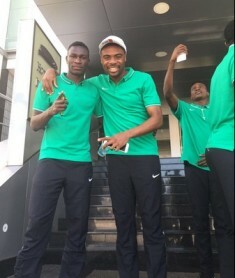 Nigeria U23s came back from an initial blip to defeat Honduras U23 3-1 in the 2016 Suwon Invitational Tournament on Monday. The Central Americans took the game to the African side at the 35,000-seater Bucheon Sports Complex, dominating exchanges in the opening minutes until they finally had their questions answered with an opener credited to striker Albert Elis. Honduras continued to be on the rampage and almost scored the second goal of the game. Lozano came close with his effort. The game went into recess with Honduras leading Nigeria by one goal to nil. With pressure increasing from the Nigerian team, skipper Azubuike Okechukwu got the equalizer on the 61st minute mark. Eight minutes after, Belgium based winger Godwin Saviour scored from the penalty spot after Abia Warriors utility man Ndifreke Effiong was fouled in the box. On 85 minutes, Tottenham Hotspur winger Nathan Oduwa earned his fourth cap for the Nigeria U23s, replacing Abdulrahman. In the 87th minute, Saturday Erimuya finally got his name on the score sheet as the game ended 3-1 in favour of Nigeria.